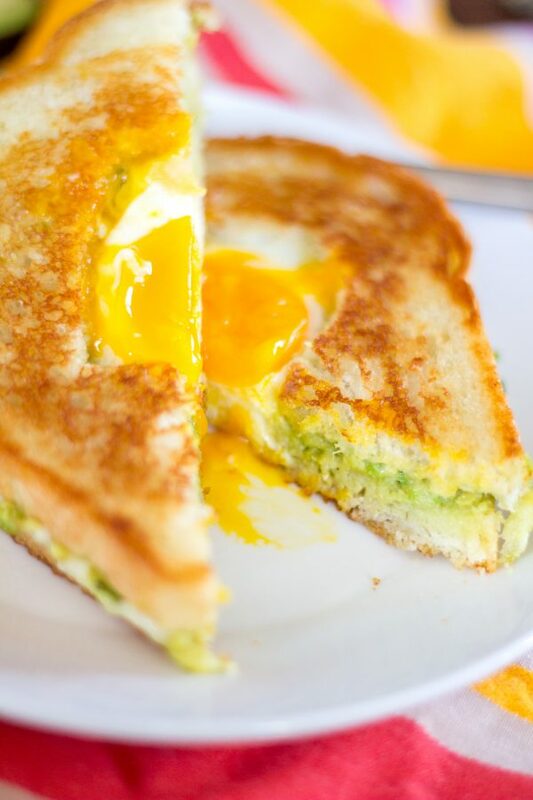 Avocado Cheddar Grilled Cheese Egg in the Hole combines three of my favorite things: grilled cheese, avocado toast, and a sunny side up egg. What more could you want? This meal is the ultimate brunch. 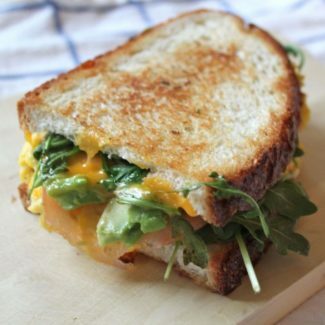 Did you know that April is national grilled cheese month?! 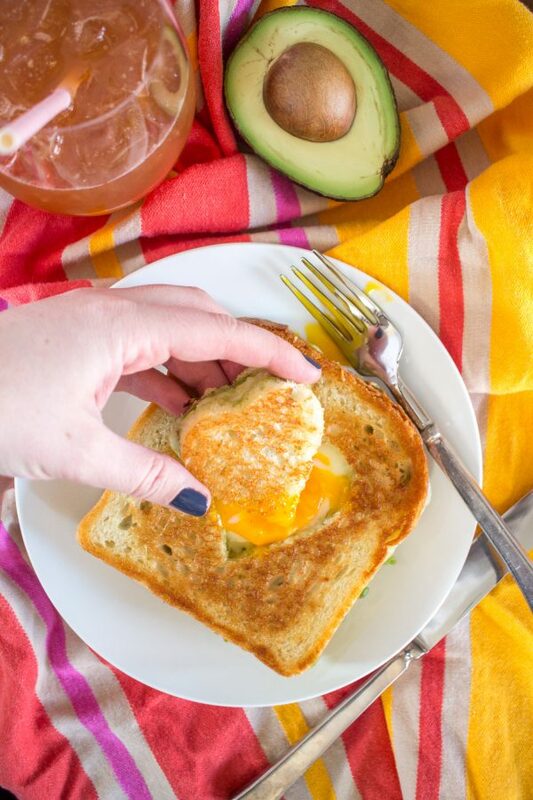 I created this Avocado Cheddar Grilled Cheese Egg in the Hole to celebrate! Some foods get a day, but I am glad that grilled cheese gets a full month. There are just so many delicious ways to serve it! 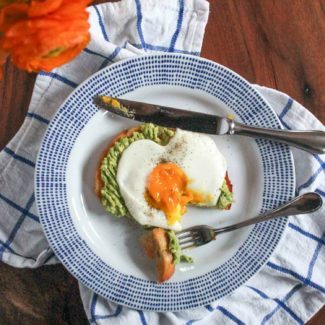 A classic grilled cheese gets a major upgrade by adding mashed avocado and a runny egg in the middle. 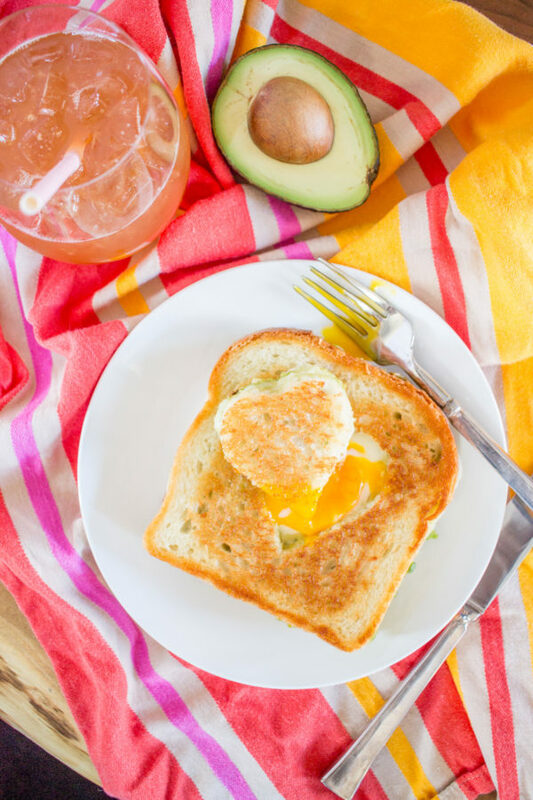 It is a grown up version of egg in the hole – a breakfast that I fondly remember my mother making for me when I was a kid. This version is even better, because I think we can agree that cheese and avocado make most things better. The total preparation time for this meal is just about 20 minutes. It takes a little longer than a typical grilled cheese because you need to add the egg after the first side of the grilled cheese has toasted. 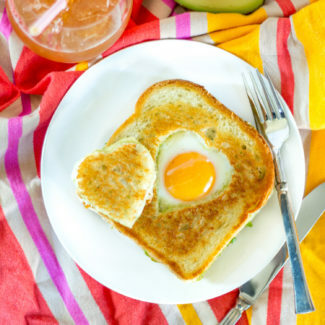 So toast one side, use a cookie cutter to make the hole (bonus if it heart-shaped), and then add the egg! Once you add the egg, cover the pan and let the grilled cheese cook for about another 6-8 minutes. Since a grilled cheese sandwich is obviously thicker than a slice of bread, you want to make the hole smaller. 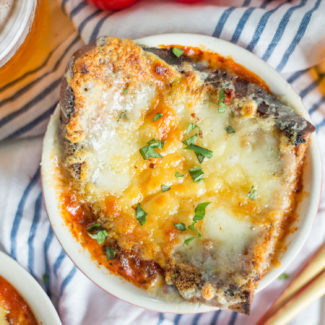 My mom always used a cup to make the hole in the bread, but you are going to want to use a cookie cutter to easily cut through the grilled cheese. I used a heart shaped cookie cutter, but most shapes will work. The secret to adding the avocado is to mash it. Sliced avocado is so slippery! You need to mash it. Avocado is a delicious addition to most sandwiches, and it tastes even better when it doesn’t slip out and fall on your plate. 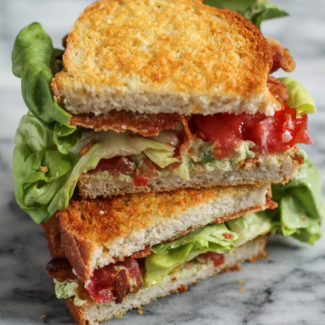 If you wanted to… you could add bacon to the sandwich. Because bacon is always a good idea. I like to start by buttering one side of each slice of bread. Putting the butter on the bread, instead of the butter in the pan is definitely the best way to make grilled cheese. Next you want to mash half of the avocado. I had a bigger avocado so half of it was just enough, but you can use more or less avocado if you like. Add a touch of salt and pepper to the mashed avocado. Place two slices of bread on a cutting board with the buttered side facing down. Then spread a layer of avocado on top of the bread, and arrange a layer of cheese on top of the avocado. Top with the second slice of bread, buttered side facing up. Heat a skillet over medium heat and add the sandwiches. Toast the first side of the sandwiches, this will take about 3-4 minutes. Then remove both sandwiches from the skillet, and place them on a cutting board with the toasted side facing down. Use a cookie cutter to cut a hole in the sandwiches. Return the sandwiches, and the holes to the pan to toast the second sides. Turn the heat down to low, and crack and egg into the hole of each sandwich. Cover the skillet, and turn the heat up to high for 10 seconds. Then return the heat to low. Let the sandwiches cook on low for about another 6-8 minutes, until the egg white has set and the bread has toasted. Increase the heat of the burner to medium low if necessary. Serve the sandwiches right away. The total preparation time for this meal is just about 20 minutes. It takes a little longer than a typical grilled cheese because you need to add the egg after the first side of the grilled cheese has toasted. 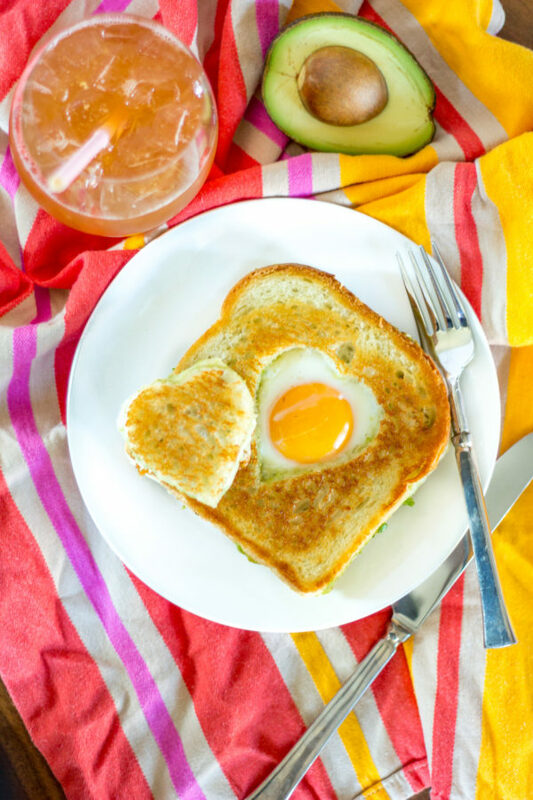 So toast one side, use a cookie cutter to make the hole (bonus if it heart-shaped), and then add the egg! Once you add the egg, cover the pan and let the grilled cheese cook for about another 6-8 minutes. Since a grilled cheese sandwich is obviously thicker than a slice of bread, you want to make the hole smaller. 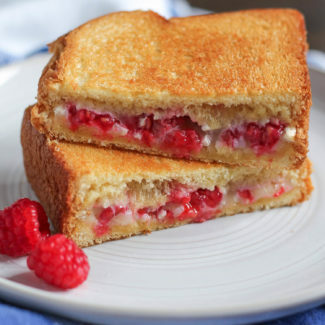 My mom always used a cup to make the hole in the bread, but you are going to want to use a cookie cutter to easily cut through the grilled cheese. I used a heart shaped cookie cutter, but most shapes will work. The secret to adding the avocado is to mash it. Sliced avocado is so slippery! You need to mash it. 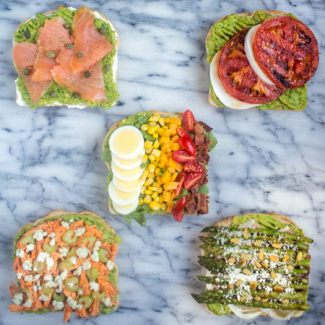 Avocado is a delicious addition to most sandwiches, and it tastes even better when it doesn’t slip out and fall on your plate. If you wanted to… you could add bacon to the sandwich. Because bacon is always a good idea.